Water sources are increasingly impacted by contamination. With population pressures, climate change, and overuse making every water source important, so water providers are increasingly looking to advanced treatment technologies to restore contaminated sources. In Industry, we can help prevent some of the sources of contamination by introducing waste water treatment solutions before it leaves the factory. The following are selected examples of scenarios in which our partners Trojan UV-oxidation systems remove potentially harmful chemical contaminants. Please call KK Water to discuss your specific effluent water treatment, drinking water treatment or industrial waste water treatment requirements. Pesticides: such as atrazine, simazine, isoproturon are examples of the wide variety of pesticides that can be removed by installing one of our industrial waste water treatment, UV oxidation systems. Nitrosamines: As a disinfection by-product (DBP), NDMA and other nitrosamines have been detected in drinking water. In some areas previous manufacturing activity has contaminated groundwater so by installing one of their drinking water treatment systems, Trojan have been cost-effectively removing these contaminants in numerous treatment facilities in North America. 1,4-Dioxane: Due to its chemical properties, it migrates farther and persists longer than other contaminants in groundwater.. The same can be said for Volatile Organic Compounds (VOCs) such as trichloroethylene (TCE), tetrachloroethylene (PCE), and vinyl chloride (VC). Fuel and Fuel Additives: The accidental release of fuels and propellants has lead to the widespread contamination of groundwater by chemicals such as methyl tertiary-butyl ether (MTBE), benzene, toluene, ethylene, xylene (BTEX) and hydrazine. Many are difficult to treat with air stripping and carbon adsorption but can be cost-effectively treated by Trojan’s effluent water treatment UV-oxidation systems. It eliminates the costs associated with the treatment of off-gases from air stripping or disposal/regeneration of spent carbon. Our effluent water treatment, drinking water treatment and industrial waste water treatment systems have been installed in reuse applications around the world. Effluents are being reused for recreational and agricultural irrigation, aquifer recharge and to reduce discharge to already-stressed waterways and rainwater being used to flush toilets. So when you are considering water reuse within your company call KK Water and see what we can offer. With the cost of water increasing, industrial companies looking to remain competitive have to consider the reuse of water seriously. It also has the added benefit of promoting their image in the marketplace as being ‘Green’ and Sustainable. In the municipal sector the reuse of waste water for augmentation of drinking water supplies (a process known as “indirect potable reuse”) is rapidly gaining support. Nitrosamines: The nitrosamines group consists of a large number of compounds formed by various combinations of amines and nitrogen, perhaps the best known nitrosamine is N-nitrosodimethylamine (NDMA). Advanced treatment technologies such as reverse osmosis, carbon adsorption, ozone and air stripping are ineffective in treating NDMA. The NDMA molecule is considered to be carcinogenic at very low concentrations and is destroyed with ultraviolet (UV) light by a photochemical process known as UV-photolysis. Pharmaceuticals, Personal Care Products (PPCPs), and Endocrine-Disruptor Compounds (EDCs): Until recently, PPCPs and EDCs were not viewed as potential environmental contaminants as their fate following use was not given significant consideration. However, with recent advances in analytical technology and a growing body of evidence of environmental impacts, this group of chemicals is coming under increasing scrutiny by water providers and regulatory agencies. As many of these contaminants are oxidizable, our effluent water treatment oxidation systems are capable of treating a wide variety of PPCPs and EDCs. Reuse does not have to involve the removal of contaminants to be successful. 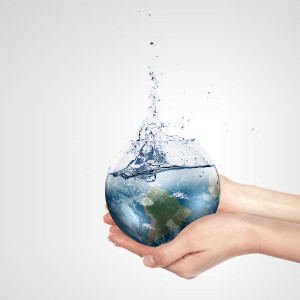 KK Water has experience within the sector of rainwater harvesting. Typically rainwater is used for non-potable tasks such as toilet flushing and vehicle washing. Each will help reduce the water usage and therefore costs of a facility, be it a business, hospital, sports centre, etc….